The villa embodies an unexpected encounter of the vernacular Collio’s landscape architecture with a contemporary attitude. This dialogue recognises the landscape elements which inhabit the region, as the rhythmic vineyards, the terraced hills and the shades and colours of the ground, and resonates into an architectural language of correspondences between tradition and contemporaneity. The result is a renovation of the original house and the demolition of voluminous bodies of pre-existing no-value building, and the construction of a new volume distributed over two floors in addition to a partially buried floor. The extension is a contemporary reinterpretation of the vernacular typology, which pitched roof is covered with a cupped one. 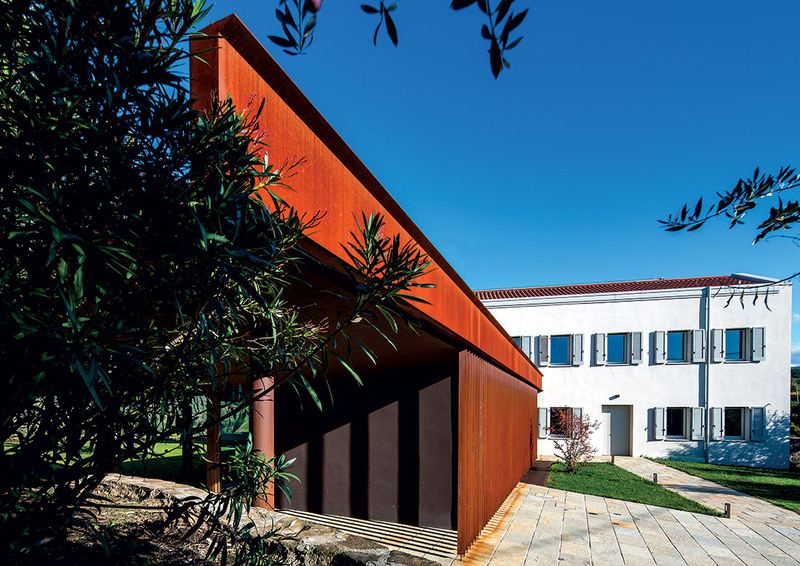 While the low volume, externally covered with corten blades and with a green cover, welcomes the new entrance, the kitchen and the portico areas become a landscape where vineyards close towards the road and embrace the view over the Collio and the pre-Alps. This project embraces a vision of architecture designed by landscape, in its responsive meaning, thus a reinterpretation of the traditional dialectic between landscape and architecture through a contemporary language.